Double Spring showing a boil, or "stack". Interesting Information: Double Spring is privately owned, and used for recreation by the owners. It takes its name from its double branch. The property is guarded by a caretaker, and access to the general public is discouraged. More information in regards to this spring can be had from two sources recommended highly to the spring enthusiast: The Large Springs of Missouri by Beckman and Hinchey, 1944, and Springs of Missouri Vineyard and Feder, et al, 1982. Brief History: Because of its private nature, not much is known about the history of the spring property. At the time of the 1944 report, it was owned by a sportsmen's club which had dammed and landscaped the spring branch to raise trout. Thirty years later the property was still being used as a private retreat. Only a few dozen flow measurements have been taken over the years. A measured maximum of 207 million gallons per day or a rate of 321 cfs puts it definitely into the "big spring" category, but the true measure of this spring is unknown. 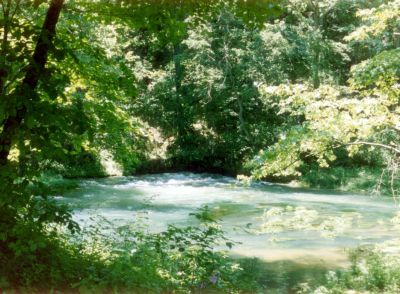 Seven measurements 1993 to 1995 produced an average of 228 cfs (147 million gallons), and local lore puts it at number 4 in the state. Ownership and Access: Private. No public access without permission of the owner.